ELMS (e-academy License Management System) is a popular Web-based management system thru which organization can manage their software licensing needs and make software available to the community members. ELMS Webstore is the one stop repository of the software applications where organizations store the softwares. Microsoft’s DreamSpark, the then MSDNAA (MSDN Academic Alliance) is a large user of ELMS which many academic institutes and students use today. Using ELMS account, students and academic staffs can download softwares and their license serial keys with ease, this model of software distribution and licensing solution is far better than the traditional ones. As written in official help contents of ELMS (#2 step in above list), there are many methods of verification of SSO for ELMS that can be used to authenticate users including email domain, user import, Integrated User Verification (IUV) and Shibboleth (from a Federated Identity Program). SSO verification methods allow a user to enter the same user id and password to log on to multiple related but independent software systems. The user logs in once and gains access to all systems without being prompted to log in again. This is one of the most common methods to authenticate users when there exists integration between multiple software or service applications. A WebStore can have multiple verification methods defined, however only one Single Sign-On verification type can be active at a time. Therefore, a WebStore cannot use both IUV and Shibboleth as verification methods at the same time. 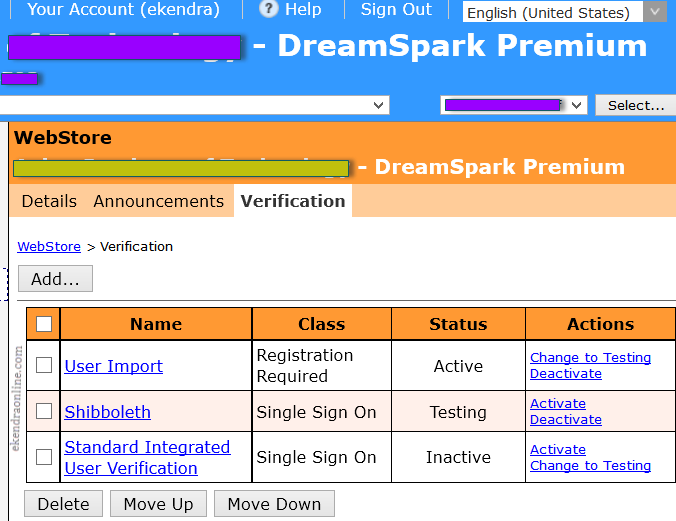 Software assurance managers and Academic Information System managers can get details for DreamSpark deployment for their university here. A piece of note, ELMS is never required if your students and academic staffs can directly login to DreamSpark main portal as listed above in #2. Note: e-academy is now called Kivuto Solutions Inc.
Disclaimer: The author has successfully completed courses on Microsoft Subscriptions Manager, Online Services Manager, Software Assurance manager and Volume Licensing Administration.